The time of their lives…that was the best way for Queensland amateur golfers Jed Morgan and Louis Dobbelaar to describe their week with Australian PGA Tour star Cameron Smith. Certainly their experience was something money can’t buy…a trip to the World No. 32’s US base was something this pair will never forget. 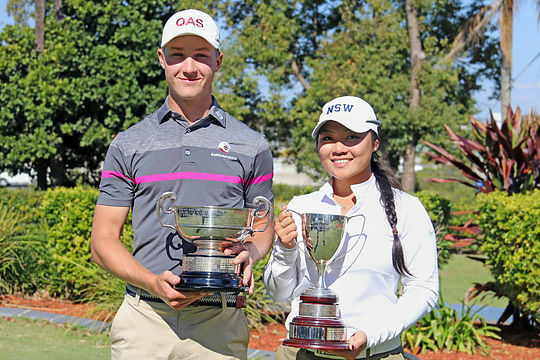 As a part of Golf Australia’s ‘Give Back’ program, 25-year-old Smith has followed in fellow Queenslander Karrie Webb’s footsteps with the Cameron Smith Scholarship. Dobbelaar was the lucky recipient of the scholarship for the first two years, but it was Morgan, from Hatton Vale, who received the $12,500 grant this year. Still the ultimate reward came earlier this month, when Morgan and Dobbelaar were invited to stay at Smith’s Florida residence and join the PGA Tour winner at TPC Sawgrass for a week of practice, play and learning. Now both Morgan and Dobbelaar get the chance to put those lessons to the test next month, as they tee it up in the Isuzu Queensland Open later this week. “It’s been a fun week bit of practise and kind of hung out and gave them a bit of an insight into what it would be like on the PGA Tour,” said Smith. Morgan agreed suggesting he would take a lot away from the week and hopefully his golf will improve much faster than before.